Foot Locker is an Australian sneaker authority. The internationally known company loves sneakers and has been part of the retail landscape for over 35 years. 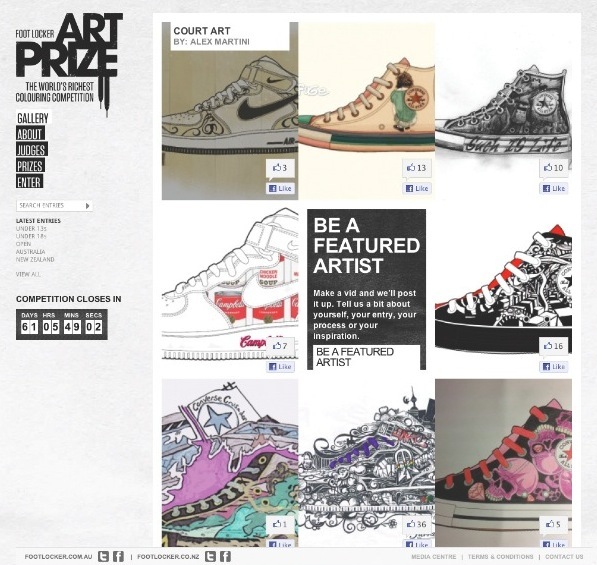 In 2011, the inaugural Foot Locker Art Prize was devised to cement Foot Locker’s position as the sneaker authority in Australia and New Zealand, as well as drive traffic in-store and increase sales. With Australia’s retail landscape becoming increasingly competitive, the Foot Locker Art Prize also set out to activate existing and new customers. While Foot Locker had a very active and loyal customer base, the Foot Locker Art Prize provided an opportunity to offer a unique perspective on sneaker culture. to promote the campaign. Not only were sneaker enthusiasts encouraged to enter, but artists, kids and students were encouraged to create art with their favourite shoe using a blank sneaker template. Combining the concept of a traditional art prize with a colouring competition was bound to stir up controversy. drive store traffic and sales. Foot Locker brought sneaker culture into the Australian and New Zealand mainstream by running its Art Prize campaign, which ignited unique aspects of popular street culture. Aesthetic and unique customised designs are a significant part of sneaker culture. The Foot Locker Art Prize strategy was to bring this to life. Although the quirky nature of a colouring competition may suggest otherwise, the Foot Locker Art Prize was a competition that trumped its more traditional contemporaries. The prize pool was one dollar more than the Archibald Prize winnings, at $50,001, making it the world’s richest art competition [Ed’s note: this was prior to September 2011, when the Archibald Prize rose to $75,000]. The chosen venue for the finalist exhibition, the Art Gallery of New South Wales, typically home to more traditional art, drove home the authenticity of sneaker art as a credible art form. Once the concept was approved, Foot Locker worked with WeAreDigital, Sapient Nitro Brisbane and DEC Communications to bring the Foot Locker Art Prize to the public. This collaborative process saw different channels utilised to leverage and communicate with current fans. entry eDM (electronic direct mail) deployment. entrants received a 20% off discount voucher for any purchase in any Foot Locker store as a thank you for entering. execution of various stunts through Foot Locker brand activities such as artist appearances at the Deadmau5 event to create curiosity around the Art Prize. The competition struck a chord, with over 6000 entries registered on the website throughout the competition period. Over 4800 of these entries were submitted online from Australia and New Zealand. over 59% of visitors came from referring sites, indicating the highly viral nature of the campaign. Further to the above results, the campaign was selected as a finalist in the Effectiveness category of the 18th AIMIA (Australian Interactive Media Industry Association) Awards. 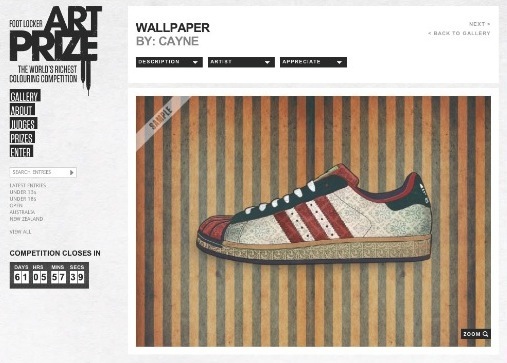 The Foot Locker Art Prize is now being developed further for future campaign growth.